Take some time to look around your house and see how you can make easy updates to not only enjoy your home more yourself but also to avoid costly deferred maintenance and unnecessary expenses and rushing around should you decide to sell. Should you have any questions about which projects will help the value of your home the most, don’t hesitate to call. And certainly if the project seems too big for a little DIY, I have great suggestions for contractors, plumbers, electricians and a whole slew of other professionals who can help you make your home the best it can be in 2012. Recession is the mother of invention. A slow economy is hard on architecture, except when it isn’t. 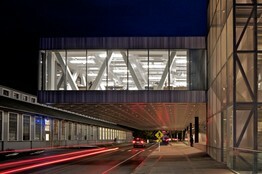 As the best buildings of 2011 amply show, closer scrutiny to the bottom line and even the need to lop off extras can lead to a sharper and more forceful design. Frank Gehry’s 8 Spruce Street, at right, dwarfs the Woolworth Building. 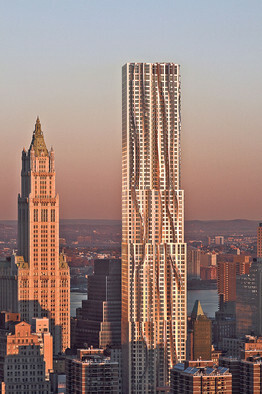 The 76-story Beekman Tower by Frank Gehry, renamed New York by Frank Gehry and now known as 8 Spruce St., opened early in the year. During more than five years of intense scrutiny, the tallest residential building in the city re-emerged after financing difficulties—and a halt in construction that spurred rumors it would be half its final height—as a rental with its market-rate rents stabilized for 20 years. For now far taller than anything in its City Hall company and dwarfing even the 57-story Woolworth Building, Mr. Gehry’s steely undulating spire—the architect’s first skyscraper in the U.S.—will make good company when joined on the skyline by all the super towers a few blocks west at the World Trade Center. Resilience also helped two museums realize their potential even as they faced delays and stiff value engineering—a construction-world euphemism for cutting corners. As a city-funded project for a perennially cash-strapped organization, the addition to the Museum of the Moving Image in Queens occasioned modest expectations. But when the addition, designed by Thomas Leeser, an architect’s architect with few completed works, opened in January following at least one complete redesign, the diamond-cut opaque facade with its canted, liquid white walls and Yves-Klein-blue quilted auditorium, among other zoomy touches, propelled the museum in a stroke to the forefront of high-tech media display spaces. In Denver, the architecture for a museum dedicated to works by the obsessively private Abstract Expressionist Clyfford Still stands out for its confident refusal to draw excess attention to itself. 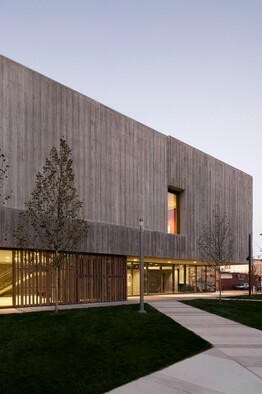 Designed by Allied Works Architecture, the firm that gave a makeover to 2 Columbus Circle in New York, the Clyfford Still Museum that opened in November is structurally a simple box made rich by textures and a subtly manipulative use of natural light. Notably, the building’s corduroy-concrete envelope echoes in the perforated cast-concrete ceilings stretched into a delicate web filtering overhead light. Architecture that elegantly showcases the art it contains without broadcasting itself has not been in fashion for a long time and is cause for gratitude. Raul J. Garcia/Clyfford Still Museum The Clyfford Still Museum in Denver has a simple structure and a corduroy-concrete surface. 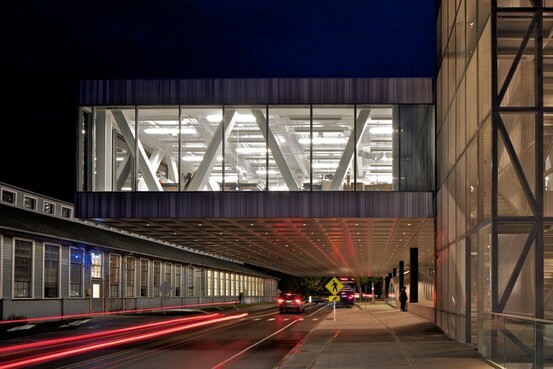 Milstein Hall shows off one extreme of a current concept popular with academic and research institutions and geared to encourage what the OMA architects call “improvisational interaction.” It could also be called design for casual socializing. The Ray and Dagmar Dolby Regeneration Medicine Building at the University of California, San Francisco is pursuing the same agenda in a warmer climate. Taking advantage of a disadvantaged sliver of a site stuck behind a midcentury university building and pinned against a forest hillside, Rafael Viñoly Architects transformed what might have been a regulation laboratory building into something more reminiscent of a Mediterranean villa. With the structure’s ascending series of terraces edged in wildflower-strewn green-roof lawns and cascading stairs and ramps, even the corrugated steel siding appears sun-kissed. The architect’s approach is organic in an almost geological sense, shaping the building in a riverbed curve and lifting it above a steep site on concrete piers to minimize its impact on the landscape. There is nothing exceptionally experimental here, but it does speak eloquently of architecture’s welcome drive to draw people into a deeper and more rewarding engagement with their environments. Author kimhuntkwPosted on December 27, 2011 January 4, 2012 Categories National Housing NewsTags Armario Homes, deanna armario, pleasanton homes for saleLeave a comment on Recession is the mother of invention. CNN Money says that, “Home building spiked up in November to the strongest level in almost two years, as record-low mortgage rates and a surge in apartment and condo construction lifted activity” (see article). What’s perhaps surprising about this trend is that much of this building is focused on apartments. With the current job market and mortgage difficulties, many are looking to rent. As more renters sell their homes or simply choose not to buy in the first place, rents are skyrocketing. This is not news to anyone in the Bay area, whose rents continue to rise and rental applications flood in to landlords. — Builders should start at least 600,000 homes this year. That’s up from 587,000 last year and 554,000 in 2009 — the worst year on record. In a healthy market, economists say, about 1.2 million homes are started each year. — The pace of apartment construction has soared. About 175,000 will be started this year, also roughly half the number in a healthy economy. But it’s far more than the 97,000 apartments begun in 2009. — Single-family home construction, which accounts for about 70 percent of the housing industry, has essentially stalled for three years. This year will probably turn out to be the worst in the half-century records have been kept. For builders, apartments are simply a better option; “It’s not as easy to get a home as it used to be,” says Rex Jensen, chief executive of the company developing a project in Fayetteville, North Carolina in the Wall Street Journal. “There are credit issues for buyers,” he says, “Also, from an infrastructure standpoint, it’s cheaper to invest in an apartment building than in a sprawling subdivision” (see article). As builders struggle to keep up with renter demands, it is inevitable that there will be some lag, as there was with new construction a few years ago. Renters will have to wait for projects to be funded and completed before moving in so that the rental shortage will continue to lead to higher rents than we’ve seen in some time and more applications than apartments. And while some worry about over-saturation of apartment buildings, it looks like this niche construction boom is going to keep going strong until these hopeful renters find homes. LOS ANGELES — Fewer U.S. homes entered the foreclosure process or were taken back by banks in November, reflecting a seasonal pullback in foreclosure activity by lenders and mortgage servicers. Banks are now on track to repossess some 810,000 homes this year, down from more than 1 million last year, according to RealtyTrac. The firm had originally anticipated some 1.2 million homes would be repossessed by lenders this year. High unemployment, a sluggish housing market and falling home values remain a major factor in homeowners falling behind on their mortgage payments. Many borrowers also have simply stopped paying their mortgage because they are underwater — a term for owing more on a mortgage than the home is worth. At the state level, Nevada had the nation’s highest foreclosure rate last month with one in every 175 households receiving a foreclosure notice — more than three times the national average. It’s true. And they’ll tell you so themselves. According to a recent Wall Street Journal article (not that an article had to uncover it – the site clearly states this itself), valuations of homes on Zillow are oftentimes 20% or even 50% higher than an eventual sale price (see article). With Zillow, Trulia, Homes.com and the like drawing the first attention from home buyers, it’s perhaps surprising that they can get away with being so inaccurate. However, Zillow will be the first to tell you that these estimates are not calculated by humans, but by algorithms that have a wide margin of error. Traditionally, an appraiser will determine the value of a home using comparable homes within a certain area; however, with simply raw data to go on, these algorithms are just not as accurate. The Atlanta Journal-Constitution cites one consumer saying what some people might think Realtors are worried about, namely that, “The scary thing that the industry needs to be careful of is that the consumer knows more than that practitioner because of these devices” (see article). However, what needs to be remedied is the over-reliance on online estimates by consumers because, as any of them will tell you, nothing can substitute (nor will it as it pertains to loans and other legalities) a human calculation of a home’s value. Zillow is an amazing resource – it lets you surf homes and take a first look as you being to search for your new home. Keep in mind, though, that searching for a new home takes more than a first look – it takes in-depth research, reliable data and statistics and a professional savvy enough to help you navigate the market. So as you’re looking around on Zillow, soak up all that it has to offer, but take those Zestimates with a grain of salt. Author kimhuntkwPosted on December 15, 2011 January 4, 2012 Categories Real Estate TechTags Armario Homes, deanna armario, pleasanton homes for saleLeave a comment on Zillow is wrong. LAS VEGAS — A new federal report shows that speculative real estate investors played a larger role than originally thought in driving the housing bubble that led to record foreclosures and sent economies plummeting in Nevada, California, Arizona, Florida and other states. Researchers with the Federal Reserve Bank of New York found that investors who used low-down-payment, subprime credit to purchase multiple residential properties helped inflate home prices and are largely to blame for the recession. The researchers said their findings focused on an “undocumented” dimension of the housing market crisis that had been previously overlooked as officials focused on how to contain the financial crisis, not what caused it. Investors defaulted in large numbers after home values began to drop in 2006. They accounted for more than 25 percent of seriously delinquent mortgage balances nationwide, and more than a third in Arizona, California, Florida, and Nevada from 2007 to 2009. As a result, millions of homeowners saw their home values decline so that they were worth less than the original purchase price. Foreclosures skyrocketed as people couldn’t or refused to pay their underwater mortgages. Residential construction also languished, putting hundreds of construction workers in the hardest-hit states out of work. The report concludes that lenders and regulators must limit speculative borrowing to avoid future housing busts. For example, in China, government officials are now requiring higher down-payments and mortgage rates on investment homes, according to the report. In Nevada, which has the nation’s highest foreclosure rate, the housing market remains weak, with home prices continuing to fall in the Las Vegas area, where most of the state lives. Home prices were down 7.3 percent in November compared to a year before, according to the Greater Las Vegas Association of Realtors. That means the median price dropped from $134,900 to $125,000 in one year. More than half of all home sales were purchased with cash. Paul Bell, president of the real estate association, said amateur investors were behind the soaring home values seen during the first half of the last decade, but noted those buyers were simply taking advantage of how easy it was to buy homes at the time because of questionable lending practices and government pressure on banks to promote home ownership. “There was blame to go around for everybody,” Bell said. The market has now shifted so that cash investors are helping Las Vegas recover by buying multiple vacant homes, fixing them up and selling them, Bell said. “If we did not have the serious investors in the market … we would have many neighborhoods in a very run-down condition,” he said. The previous blog post (see here) noted that women are 32% more likely to pay a higher interest rate on their loan, according to the Journal of Real Estate Finance and Economics. Ostensibly, women are far more likely to take the advice of a friend or colleague rather than consult with several different lenders and compare (see article).Now for some advice to women to close that gap and make us all more informed consumers. Be sure to look not just at different lenders, but at different types of lenders; check out large national banks, mortgage brokers, online lenders and smaller lenders to ensure you’re getting the best range of options. Also, make sure you’re comparing the same loan product. A 30-year fixed at a national bank will have a very different rate than an ARM at a smaller lender. And on top of the type of loan, remember that rates change daily, hourly in fact; try to cross-reference these loans within the same day, or preferably within the same part of the day, if possible. If you’re having trouble remembering who you talked to and what you talked to them about, try writing several scripts and working on a spreadsheet so you can keep the data in the right place. This will also make sure that you’re asking them the same questions for certain pieces of data – rates, terms, points, etc. As you work on your script, become familiar with loan terms so you know what you’re dealing with (you can do that here). A little up front research can go a long way to prepping yourself for these conversations. It will also keep you from worrying about getting the run-around because you’ll know what you want before you call. So when it comes to advice from our friends, ladies, keep an eye on what we have to do on our own to make sure we’re making the best possible decision for ourselves as we move into our new homes.